Amazon has announced a new 2016 Fire TV Stick featuring Alexa Voice Remote and much improved hardware. Here’s everything you need to know. 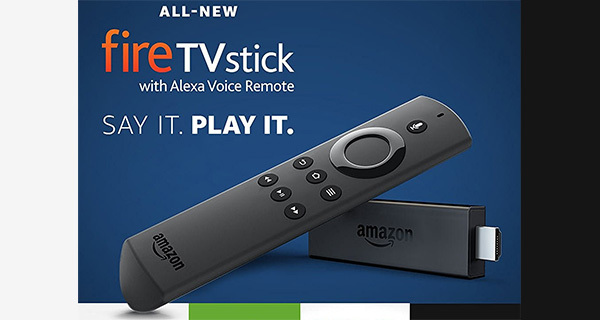 If you’re looking for a streaming stick that plugs directly into your TV via HDMI, is extremely good value for money, and comes with a remote control that seriously outsizes the product itself, then this latest Amazon contraption could be the perfect fit. The new Fire TV Stick offers direct connectivity with a TV’s HDMI port or computer monitor, as well as the ability to stream music, videos, and of course, games directly downloaded from the company’s Appstore. All of that sounds great, but not particularly different from last year’s Fire TV Stick, so what has changed? Well, this latest hardware announcement by Amazon offers speeds that eclipse the previous generation hardware by up to 30-percent thanks to the new quad-core processor that’s squeezed into the tiny frame of the new Fire TV Stick. Oh, and if that wasn’t enough for you, the updated remote control that comes with the new Fire TV Stick hardware is also Alexa-enabled for immediate voice control. Taking away the speed improvement made with this new Fire TV Stick, Amazon has immediately positioned the new hardware ahead of Roku’s 2016 Streaming Stick and Google’s second-gen Chromecast, both in price and feature set. There’s also the fact that the Fire TV Stick, when connected to an Internet connection, benefits from over 300,000 TV shows and movies, as well as access to Amazon’s own library of apps and games. Unfortunately for those who love their content delivered in the maximum resolution possible, there’s no 4K support here, but 1080p full high-definition instead. Similar to how the Siri control works on Apple TV, new Fire TV Stick owners will be able to use the new remote control to play gaming titles such as Pac-Man 256 and the famous Crossy Road, as well as instantly invoke Alexa to search for content or launch apps with a single voice command as well as control home automation devices. Perfect for those who simply have no desire or will to interact with these platforms in a traditional manner. 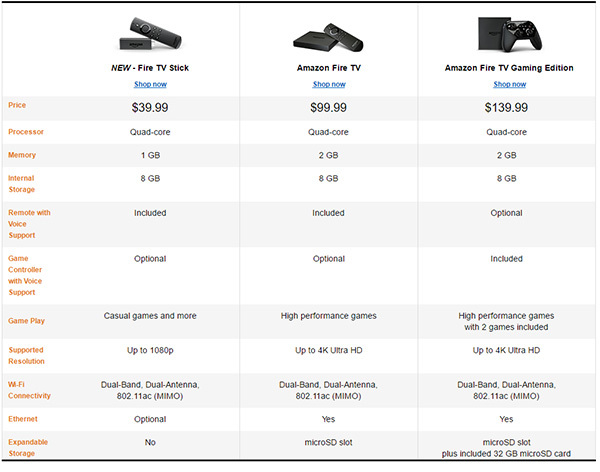 For a complete list of specs and how Fire TV Stick 2016 compares to the rest of the Fire TV range, check out the image below. Amazon is accepting orders for the new Fire TV Stick with Alexa Voice Remote starting from today, with consumers expected to part with $39.99 to own one. Additionally, for those that purchase and activate the new product before October 31st, there’ll also be a sweetener in the form of a month’s worth of free Sling TV, two months of Hulu subscription, and a $10 credit for Amazon Video. Here we are, late 2016, and the Nvidia Shield TV still sits on top.